Pre-cut Shims, a simple solution for the complicated problems of misalignment, that causes vibration, noise, breakdown, loss of energy & productivity etc. We manufacture and supply alignment shims for Tavera, Sumo, Bolero and Ambassador. Enriched by our vast industrial experience in this business, we are involved in offering an enormous quality range of Pre Cut Shim. 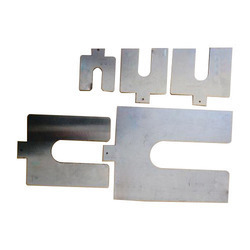 Pre Cut Shims are designed for machine alignment. 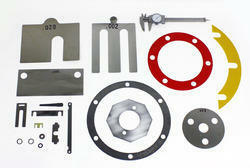 We deliver also various other custom made shim types. As per the rising and changing demands of our patrons, we are immersed in providing an extensive Alignment Shims. We take pleasure in introducing ourselves as leading firm by offering Car Allignment Shim. By leveraging upon our huge industry experience, we provide the best quality array of Alignment Shims Wheels. We are a coveted organization that is engaged in manufacturing and supplying optimum quality of Alignment Shims. We Manufacture Pre Cut Alignment Shims as per drawings and requirements, in all the thickness available. Accurate machine adjustment is an essential element of any alignment process. SKF single slot pre–cut shims are available in five different dimensions and in ten different thicknesses.